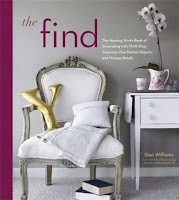 It has truly been a big week for The Find: The Housing Work Book of Decorating With Thrift Shop Treasures, Flea Market Objects, and Vintage Details. First off, starting today, Ideeli.com will be offering limited quantities of my book in its Random House sale. If you're interested in purchasing a copy for yourself or even for a gift, Ideeli's offering is a fantastic way to get it along with other gorgeous Random House imprints, all at great prices. Sign up here: http://www.ideeli.com/invite/stanleywilliams1, and click over to the Random House sale and look for The Find. Then let me know if you purchase my book, and I'll send you personalized bookplates! 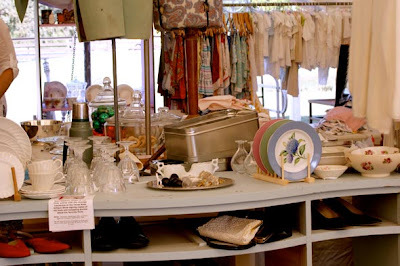 A few weeks ago we headed out to New Jersey to do some visiting and of course some thrifting, and the discoveries were beyond amazing. Here's a scene in front Boyden's Attic in Glen Gardner, and no, I'm not for sale, but this selection of chairs, smattering of tables and even a singe canoe certainly was! 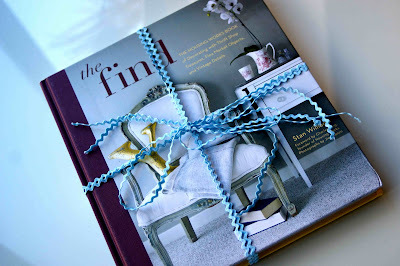 On a side note, Ideeli.com will be offering limited quantities of my book The Find: The Housing Work Book of Decorating With Thrift Shop Treasures, Flea Market Objects, and Vintage Details this week. If you're interested in purchasing a copy for yourself or even for a gift, this is a fantastic opportunity to get it, along with other gorgeous Random House imprints, at a super-low price. Use my personalized invitation to get alerts of upcoming sales here: http://www.ideeli.com/invite/stanleywilliams1. And I'll let you know when the sale goes live -- possibly even as early as tomorrow! You've heard me talk about the fabulously talented pals Heather Kerr, Michael Quinn and Ron Rangel, so it shouldn't come as any kind of surprise that when they put together a gift for a friend's birthday, the wrap would be just as sensational as its contents. Don't you love the way they spelled their friend's name with colored tape on solid wrap? I'm a careful unwrapper who annoyingly peels off the pieces of cellophane to preserve the paper with a minimum of tears. But this display would make even me want to rip right in to see what's inside. Anyone who has ever strolled New York's lower Fifth Avenue will most certainly have remarked about the clever windows at the legendary Paul Smith store there. Knows for his quirky sense of humor and bold tailored apparel, this British designer's windows never fail to please the eye and tickle the imagination. This "timeless" window display is fashioned out of a variety of clock movements attached randomly to a piece of painted pegboard. When passersby gaze into this vitrine, they may not know what the hour is, but to some it may say: "Time for a new suit!" Of all the images in The Find: The Housing Works Book of Decorating With Thrift Shop Treasures, Flea Market Objects, and Vintage Details, this one of the shell encrusted fireplace of Coastal Living's Heather Chadduck has been a crowd pleaser. Like many people who wrap memories around objects, I sometimes find it difficult to let go of items that carry special sentiments of times spent with good friends in unique places. This blue vase has lived with me for at least 15 years, having been discovered in a thrift store at Coney Island. It was a sunny, summer day that we hopped the subway and traveled out to the gorgeous New York boardwalk to celebrate the annual Mermaid Parade, and of course, I found a bargain on this blue glass. I covered it up in paper, put it in a plastic bag and toted it around all day long along boardwalk and right on the beach. Why, I even held onto it for dear life as we rode the infamous Cyclone roller coaster -- twice! 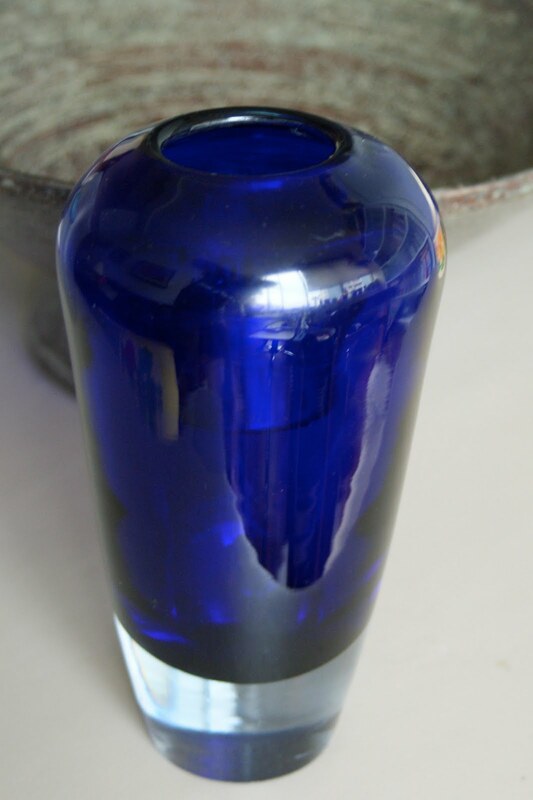 I let this blue vase go at the Carroll Garden's stoop sale this past weekend, but as I sold it I told the buyer, a livery cab driver who had spied it from his car and asked where I found it. "I thought you were going to say you bought it in Italy or France, or something, but Coney Island?" He still bought it for the asking price of $5, proudly took it back to his car and drove off! You may recall these Japanese cups and saucers I found in my compactor room. Oh, they're lookers, that's for sure. But as pretty as they are, I think they'll look even better in someone else's china cabinet. Off to tomorrow's stoop sale in Brooklyn they go! Everything I'm sharing with you today came from garage sales in Los Angeles, including this bag of trims and chains I bought splayed out on a driveway somewhere in Santa Monica. I used a few of the chains to repair some handbags I was selling at the flea market, but the trims have sat in the bottom of a bag for more of a year. Time to say ta-ta to the trims and chains sell them at Saturday's Carroll Gardens Brooklyn stoop sale with the insanely talented Heather Kerr and Michael Quinn. I'm also giving up this joyful yellow juicer, once again discovered on the rounds in LA with my garage sale-ing pal Ruth Handel. 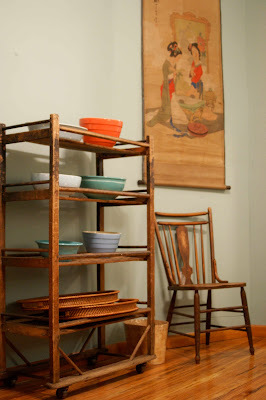 We bought it as room décor for a fabulous yet frugal party we threw for a preview of The Find: The Housing Works Book of Decorating With Thrift Shop Treasures, Flea Market Objects, and Vintage Details. (You can read the LA Times coverage of the party here.) I brought the juicer home to New York where it has lived atop my kitchen cabinet gathering dust and soot. I gave it a good scrubbing, but like the bag of trims, I'm ready to say bon voyage to this cheery lovely! Here's another sweet something that will be priced to sell at the stoop sale with Heather Kerr and Michael Quinn on Saturday, August 21. I bought this vintage, pink baby scale from one of my favorite thrift shops that was going out of business thinking I would use it as part of a table display for a baby shower one day. But did that ever happen? No siree! Instead, it has lived underneath my living room side table for the past few years, and I'm giving her up for adoption. As you may know from yesterday's post, I'm prepping for a stoop sale with Heather Kerr and Michael Quinn on Heather's stoop in Brooklyn on Saturday, August 21, and here's a little guy who's going up for sale. His cheery mug has brightened my bookshelf for almost 10 years, and he seems to need a change of scenery. Hopefully, a new home is all he needs to put on a happy face! There's nothing more exciting than going to a garage sale, but the New York version takes place on stoops of apartment buildings where residents place their wares out on the sidewalk for sale to the delight of passersby. And for the very first time, I'm participating in a Brooklyn stoop sale on Saturday, August 21 (cross your fingers for good weather) with my amazingly talented pals Heather Kerr and Michael Quinn. 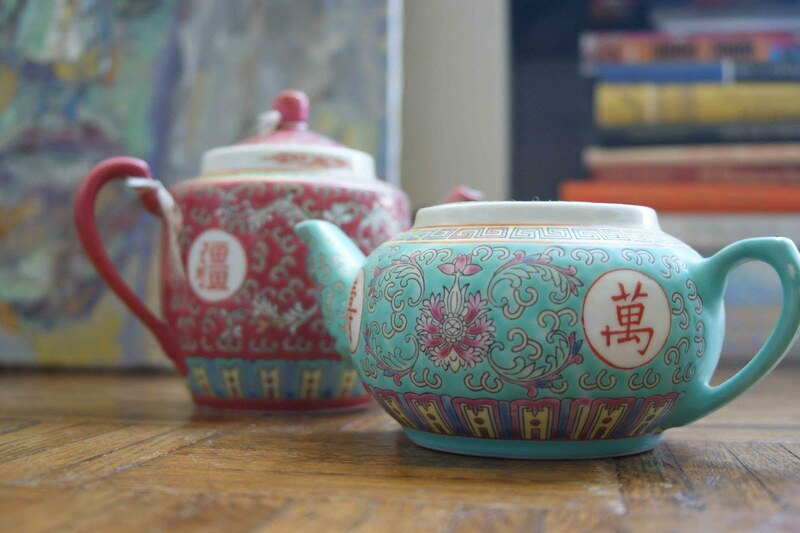 Each day this week I'll share with you a little something that'll be sitting on Heather's stoop, and today starts with this duo of Chinese teapots. While technically not vintage, they are sweet, and hopefully someone will want to take them home. A few years ago I bought these cheery pieces in Chinatown to practice creating floral arrangements for a friend's wedding. Let's just say she decided to hire a florist, but I ended up keeping the pots! It truly annoys me how poorly made home appliances are these days. You can imagine how irritated I was the other day when the cooling unit in my bedroom went out. And might I add during a brutal New York City heat wave? Thankfully, Veli had made a visit to the recycling room just a few days earlier where he nabbed this practically new oscillating fan. So until the unit is repaired -- and hopefully that will be done by the time you read this -- here's the new addition in the bedroom. Oh, the pressure is on! I've been asked to put on my florist cap again for a Dinner With Bevy-produced VIP dinner during Nike's World Basketball Festival this week. 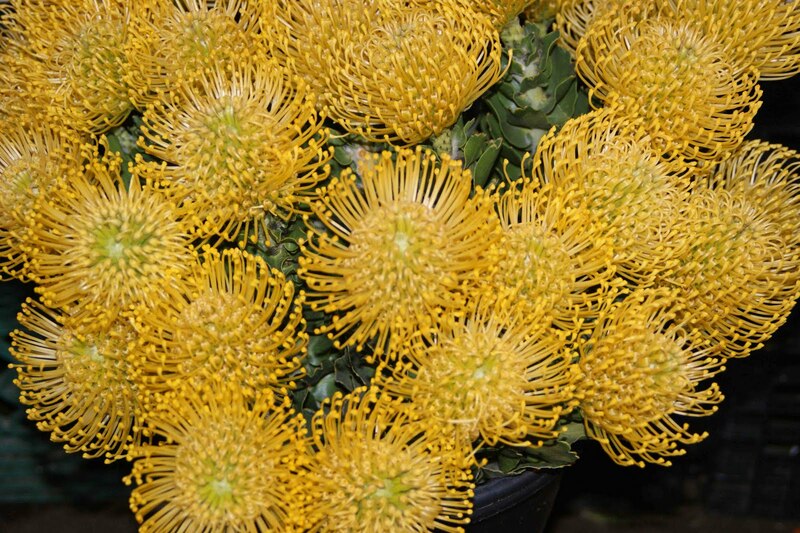 The big event is tonight, so I'll leave you with some of my picks from New York City's flower market for this evening's arrangements. As you know, I rarely write about new furniture, but this table at Restoration Hardware recently caught my eye not only for its elegant, textural qualities but also because of its repurposed origins. Crafted from wood harvested from 100-year-old buildings in Great Britain, this table was conceived by London antiques dealer and reproductionist Timothy Oulton and retails for about $2,500. 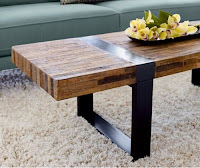 Crate and Barrel also has several repurposed pieces in its collection this season, including this rustically modern Seguro coffee table, $699, created out of peroba wood plucked from collapsed buildings in Brazil. This concept of reclaiming unwanted wood and making it into fine furniture got me thinking of all the tilted barns and dilapidated side buildings that dot the Midwest countryside. An outdated outhouse transformed into a fancy side table? A chicken coop refashioned as country-chic armoire? Or maybe a barn door retooled for a charming headboard? I'm not joking! So if you catch me carrying off hunks of your deteriorated old buildings, don't shoot! I promise to share the profits! Really! While some people claim to have a fairy god mother, can you imagine having a magical, decorating uncle? That's how you might describe Kevin H. Beer, an artist, an antiques dealer and a decorator who flew cross-country from Los Angeles to whip together the New York City East Village apartment of his niece, Taryn, an ICU nurse, who just married Jay, a medical doctor. 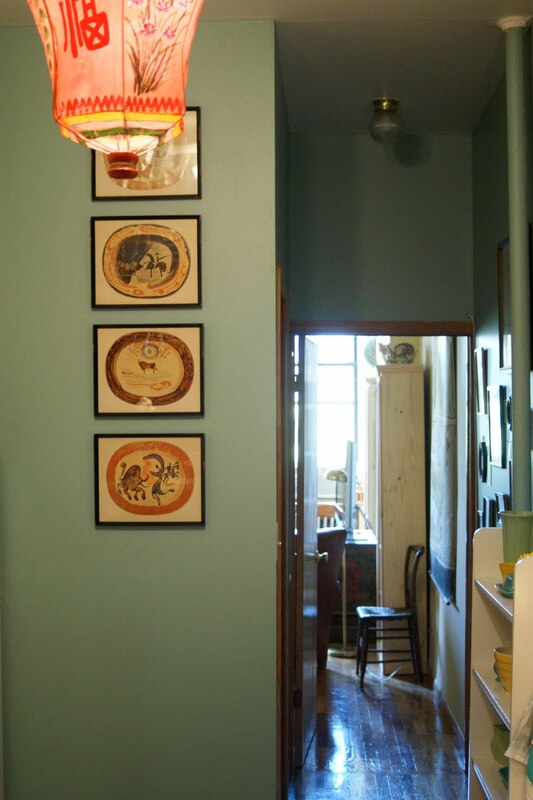 Known for his clever style and his penchant for uncovering vintage treasures that add warmth and charm to an environment, Kevin, who is also the proprietor of Hollywood Forever, Kevin, pretty much decorated this generously sized one-bedroom, railroad rental in little more than a weekend and several trips to flea markets and thrift stores. Before Uncle Kevin's arrival, the busy couple had the apartment professionally painted. Even so, one of the first things he noticed upon arrival was the lack of brightness in the space. "Jay and Taryn just got married, so I wanted to make the place fun and not to serious," he says. 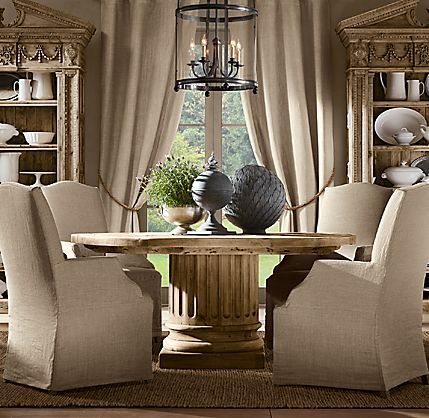 The morning after arriving, taking measurements and arranging furniture, Kevin and Taryn, armed with a $500 gift certificate, hit Crate and Barrel, to buy everything they could find in the color yellow. The living room, dedicated to the maps of the world, already had an unexpected pop of purple with its previously purchased modern Crate and Barrel sofa, and the framed piece above it portraying the rock strata of England plays into the established theme. The exotic trunk purchased from ABC Home reminded Jay of one he saw on his travels to Nepal, a theme repeated throughout. 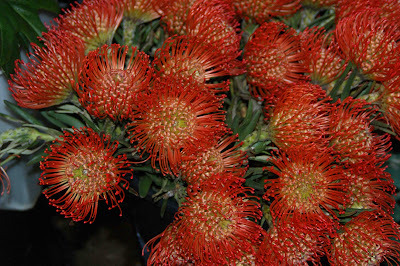 "Jay had the opportunity to go with a couple of other doctors to the Everest base camp a couple of years ago and came back with some beautiful mementos." 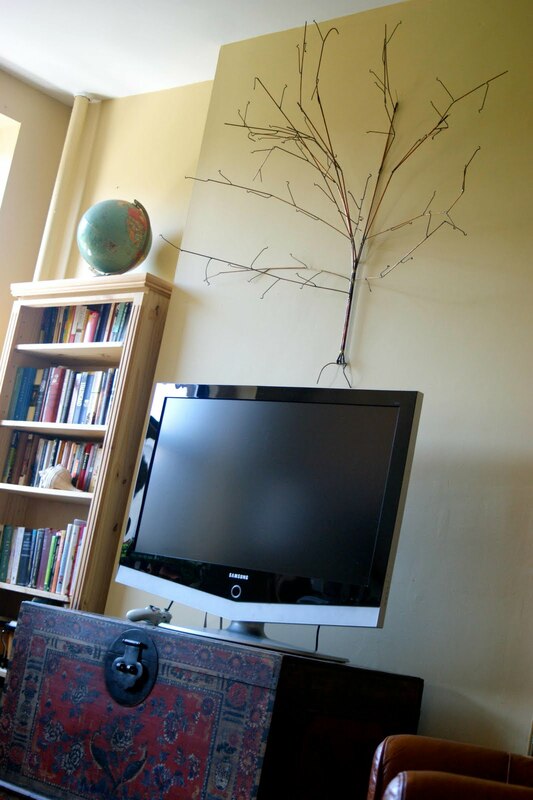 Above the television hangs a metal sculpture discovered by Kevin at Junk in Brooklyn. The exotic Cyprus root lamp and the demure chest it rests upon also came from Junk. A duo of paint-by-number geishas, again from Junk, greets guests as they enter this happy and cheery apartment. A memory wall in the hallway combines framed prints and tacked up photos add texture and personality. " 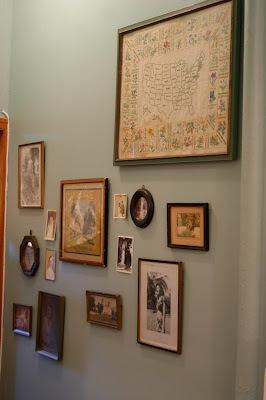 The photos in the hallway are some that I've stolen from family members over the years," Taryn says. "They keep me connected to my loved ones who feel too far away sometimes. The embroidered map of the state flowers -- banished from the map room for not being serious enough -- I bought at the Brooklyn Flea market." 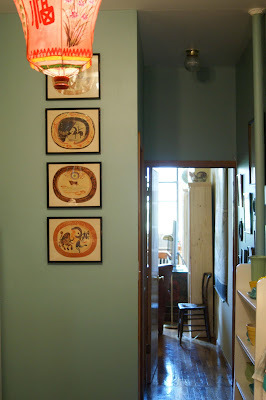 Uncle Kevin found the four Picasso plate prints for $50 at the Antiques Garage in New York, hung them on the wall in the kitchen and illuminated them with Chinese lanterns from Pearl River in SoHo. "Pearl River is awesome," Taryn says. "I wanted the tattered old ones hanging on display and the ladies who were working that day could not understand why I would want something so beat up. It was hilarious. I think they turned out well." 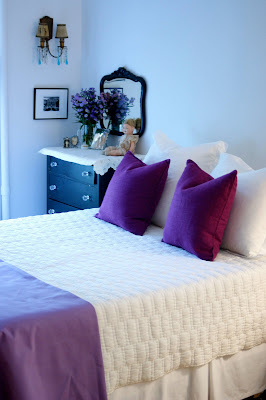 The relaxing bedroom repeats the purple in the living room sofa, carrying the color story from end to end. The Austin native bought the dresser when she shared a West Greenwich Village apartment with a girlfriend. "They have a little swap met on Greenwich Avenue in a school parking lot that had such good prices for the area," she says. "I can't tell you how many things we lugged back to our sixth floor walk-up." An inexpensive wall hanging from Pearl River covers an unattractive fuse box in the entry area. 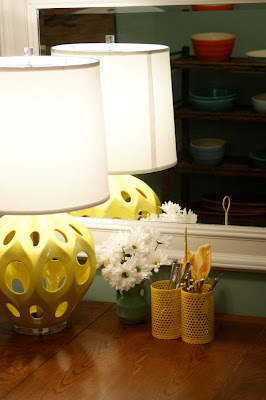 A joyful, yellow lamp from the East Village's Lancelotti Housewares rests on a sturdy, $200 dining room table from Cure Thrift Shop. 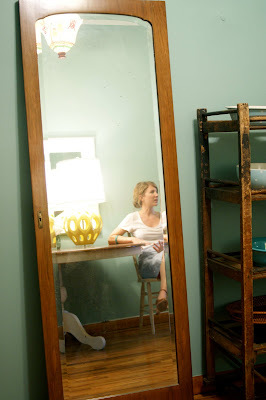 When her former roommate in the West Village tired of not having a full-length mirror, they found a clever option in an armoire door that cost about $30 at Housing Works. 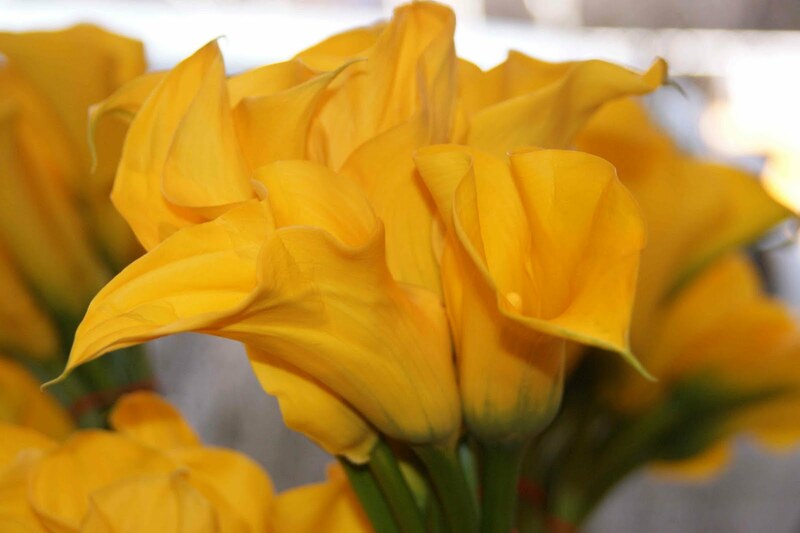 The mirror was placed to reflect the vivid yellow piece of lighting on the opposite wall. 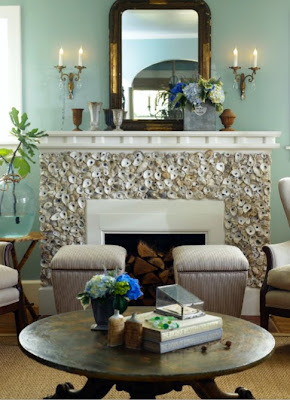 With a mixture of old and new, and creative insight and practical know-how from Uncle Kevin, what was once a typical, boring rental has been transformed into a whimsical and wonderful love nest for a sweet pair of newlyweds. If you've followed me for any length to time, you probably know that it's easy for me to turn nostalgic for France, especially Paris, my favorite place in the whole world, and Bordeaux, where I studied at the university there. This sign posted near the door of a shop on Broadway made me think especially of Bordeaux on a rainy day, when the main cobblestone pedestrian area, rue Ste. Catherine, became slick as ice as soon as the drops started to fall. With its translation of "Wipe your feet, please," this demure metal reminder also carries my thoughts to the days in France when people rarely (actually never) picked up after their pets. Literally, people in Bordeaux walked looking down -- not because they were unfriendly or aloof. They were simply trying to avoid disaster, especially on rue Ste. Catherine, which was a major wipe-out zone, particularly when it rained. So without wandering farther down what could be called a slippery slope, I'll just say that I always try to wipe my feet before entering one's home or business. It doesn't hurt, and it's the polite thing to do, s'il vous plaît. The Gift of Thrift: In the Mail! I must be among the few people I know who still looks forward to receiving mail. I have friends who complain about the junk, the bills and all the other stuff that they find an annoyance. I, on the other hand, eagerly await the mailman to complete his sorting and place the arrivals in each apartment's individual box. I'm usually awaiting a check from a client, which when one finally arrives I feel like I've just won the lottery. (Don't get so excited. I don't charge that much!) And of course there are bills, which I put away as soon as I get back into the apartment, and junk mail, which I try to deposit in the recycling bin before returning to the apartment. And then there are days like this one, when there's a note left with my doorman saying I have a package! I'd ordered nothing and wasn't expecting anything, but was thrilled when I saw the return address of my favorite garage saling pal Ruth Handel on the envelope. And wouldn't you know the contents would be the perfect lift on a day when my mailbox itself contained a junky catalog, an invitation to use one of my credit cards even more and a magazine that I don't even know why I receive. (No names!) Oh, and no checks. 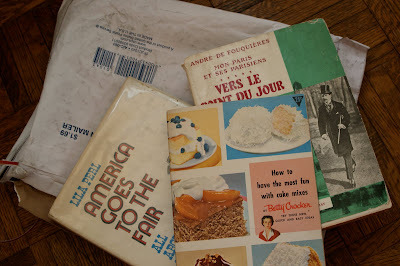 It was a virtual library of everything I love inside one envelope: a paperback in French with many of its pages still uncut, an old library book about American fairs (How much fun I had with Ruth last year at the Los Angeles County Fair!) and a vintage Betty Crocker cookbook on how to bake with cake mixes. Oh, she knows me well. 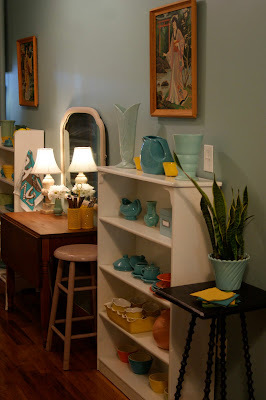 Fabulous & Frugal Fun: All Keyed Up. When I tell people that at my first job in journalism I wrote all my copy on an electric typewriter, they have a hard time believing me. 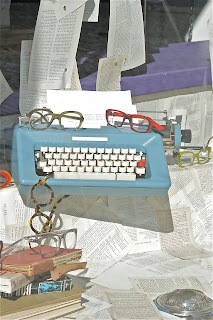 So it goes without saying that I still have a fondness for typewriters. I love the way a typewriter's keys press the type into a page and the clattering sound it makes in the process. And then there is a carbon-like smell that comes from within that may come from the ribbon that allows words to appear on a piece of paper. 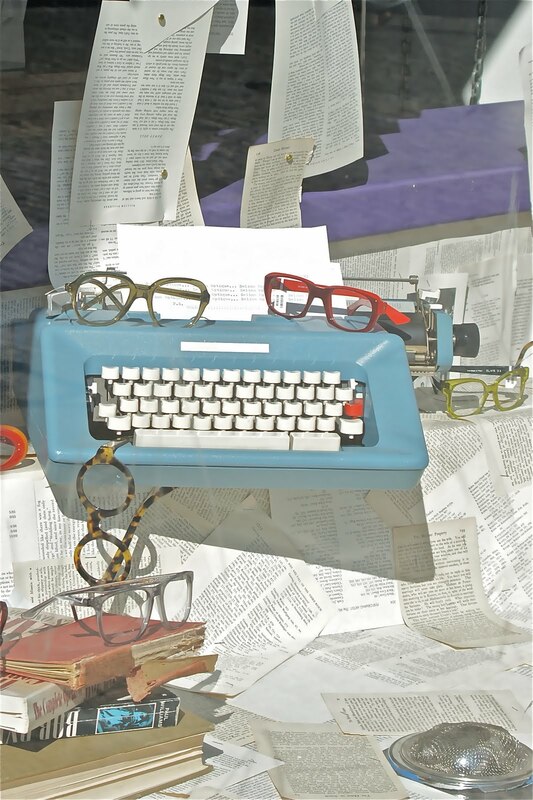 This Olivetti number sat in a window for Selima Optique at Bond 07 just a few blocks away, showing off the French brand's eyewear as the machine appears to spew out pages of type. Any time I've seen one of these technological relics from the past sitting in a room and filled with paper, you can bet that someone has fiddled with the keys and left a message. I know I certainly would! Don't throw out those seed catalogs! Take a tip from Alice Quinn, the creative mother of the fabulously crafty Michael Quinn. Cut the old publications into strips and weave them into a colorful basket just like the one she did for me. 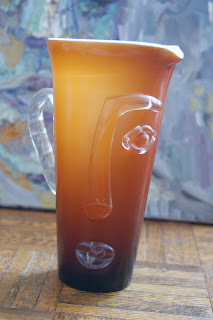 Clear glass is a decorative chameleon, taking qualities of whatever you decide to put inside its confines. 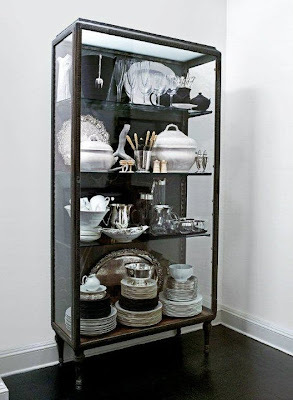 Here are three examples of a glass and metal display cabinet that was in the apartment of Randall Beale, half of the fabulous Beale-Lana design team. This is a photograph of the first time I saw the case in Randall's apartment. 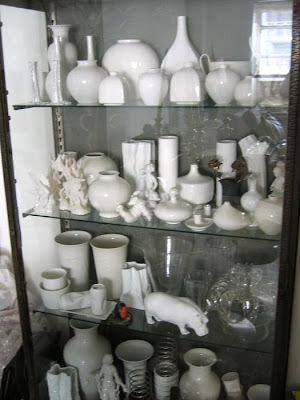 It was filled with a mixture of white porcelain and clear glass objects. 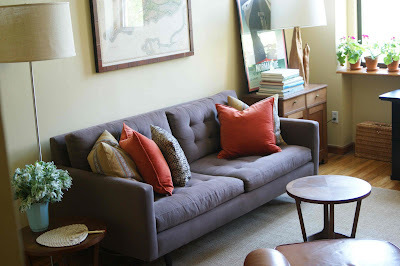 Here it is again as it appeared in the pages of House Beautiful. Note how the black, white, metallic and clear objects are placed to entertain the eye and move it along from top to bottom. 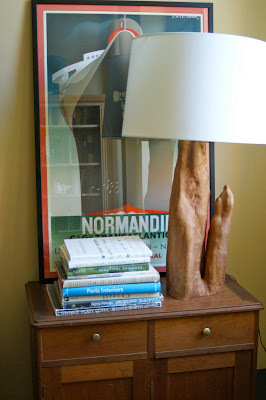 And finally, here it is as photographed by Jim Franco for The Find: The Housing Works Book of Decorating With Thrift Shop Treasures, Flea Market Objects, and Vintage Details. 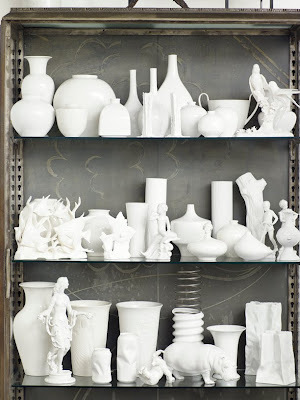 The pure white story unifies incongruous shapes and casts a sense of drama that is a hallmark of this decorating duo. I am a watermelon snob. I can't help it, it's just the way I was raised. Having grown up on watermelons harvested in rich clay soil of southern Missouri and northern Arkansas, few melons can compare to the ones that come from these regions. The subtle sweetness, the way the dewy flesh melts in your mouth, and even the seeds are among my favorite summertime memories. And may I add that I only like watermelon in the summertime. I don't mind eating berries year-round, but watermelon never tastes good in the dead of winter or at an autumnal table. And why is it that in New York only seedless versions of watermelons are sold in most stores? I wonder if other watermelon snobs would agree with me that seedless watermelons just don't taste as good. I'll take the seeds and spit them out. Isn't that half the fun, anyway? Surprisingly, I found this watermelon a couple of years ago in Croatia at a roadside stand just outside the capital city of Zagreb. It was full of seeds and was just as sweet as the ones I remember my Uncle Tab growing on the farm outside of Mulberry, Arkansas. The Croatian varieties were so good that ate one every day while I was there. Seriously!